The Pilot is an in-ear real-time language translator that will discreetly and instantly translate conversations into each of the participants’ language, provided it’s a European Latin or Germanic language. Rhian Lewis was born with retinitis pigmentosa, a disorder that destroys the light sensitive cells in the retina, leading to blindness. In January, Lewis received a "bionic eye" -- a tiny chip implanted in her right eye. The device reconnected her optic nerve with the brain, enabling her to regain a significant amount of sight. At the Georgia Institute of Technology, Jill Watson has been helping graduate students with their projects for over five months, answering questions via email and chat room sessions. Did I mention that Jill is a robot, and none of the grad students has noticed? An “origami robot” is so small and flexible that it can be folded and swallowed whole. In the tummy, the robot unfolds to retrieve foreign objects that were accidentally swallowed. Google’s new Art Camera has an insanely high, multi-gigapixel resolution suitable for preserving great works of art. But its real claim to fame is speed; an exposure that once took 24 hours can now be completed in 30 minutes. 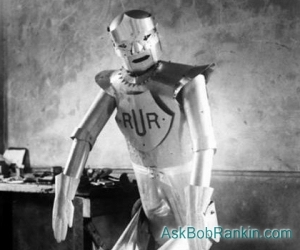 “Eric,” the UK’s first robot (built in 1928) will rise again now that Science Museum curators have found his plans. Eric will be reconstructed and sent on a tour of the world, the museum folks promise. Let's hope he fares better than HitchBot. Google is paying some lucky Arizonans $20 per hour to ride around in the company’s self-driving cars, paying close attention and taking copious notes. UPS has become the first major package carrier to let recipients track the final movements of their packages in nearly real-time. The Follow My Delivery button in an emailed shipment notification takes you to a page that refreshes every 2-3 minutes, showing on a local map exactly where the truck bearing your package is. The idea is that you’ll be standing at the front door when the driver pulls up, saving him time and you stolen packages. In 2010, Alex Jason traded a minibike and an electric snowblower for an iMac G5 computer. Today, 15 year-old Alex has a gigantic collection of vintage PCs, including 200 Apple computers. His collection will soon be housed in the Maine Technology Museum, a converted library. Clifford Stoll’s 1995 Newsweek article, “Why The Web Won’t Be Nirvana,” dissed things such as ebooks, portable mobile computers, and online shopping. But it's still a worthwhile read that predicts many of the social, economic, and technical issues plaguing the Web today. Bear in mind that the Web was invented in 1993. A study by Sensor Tower Store Intelligence reveals the discouraging news that 94% of all revenues generated by sales of apps through app stores accrue to just 1% of app developers. LinkedIn suffered a data breach, losing 100 million of its users’ email addresses and passwords. “Change your password NOW!” is LinkedIn’s helpful advice. Most recent comments on "Geekly Update - 25 May 2016"
That's Strike Two for LinkedIN !!! "... 160,000 customers’ banking records left the offices of the Federal Deposit Insurance Corp. on unauthorized removable storage media..." Why, oh why would any of that information even be stored on removable media? So far I have no updates for my package from UPS, it says out for delivery, not the location of the Vehicle or Package. perhaps it requires a higher paid membership, I already have a UPS My Choice Upgrade. Autonomous driven vehicles are a great thing to look forward to in the near future, but I have some major concerns about the new requirement that all new cars sold in the U.S. in 2018 and forward must have the automatic stop feature built in. If only new vehicles have that feature and I am driving one of those vehicles and because I get distracted while driving and my vehicle slams on the brakes, but the vehicle behind me does not have that feature, my vehicle could become the filling in the middle of a multi vehicle crash caused by my vehicle stopping before the drive behind me can react. this could be a very dangerous senario. Every techie source has instructions on how to deactivate copying to thumb drives. Any tech officer who fails to do this is grossly incompetent. @Ed Lieber - Mch better I guess that your car slams into the car in front of you while you are distracted and then become same sandwich, but now undoubtedly your fault. I wonder if the real time tracking will detect the package being tossed on the door step when the recipient is out doing other things besides waiting for a package. The Package Receipt Business has its UPS and DOWNS. Seems like they're backtracking on the claims for that Pilot translator. Sure seems like a great idea if they could get it closer to the present than Star Trek. "Every techie source has instructions on how to deactivate copying to thumb drives. Any tech officer who fails to do this is grossly incompetent." Let's see...FDIC...government corporation...and what part of government did you not understand?